On a recent road trip, I picked up some new-to-me boxed foods and realized that I should share them with our readers. Given Denise’s corn allergy, I’m the only one buying food in boxes anymore, so I’m going to try a little harder to review things as I find them. Bear with us. I would love to say I would offer you photos of the foods as well as the boxes, but can I admit that I realized I should do this as I went to throw out the boxes? There was no food left! These cookies were found at a fantastic little natural food store in Beacon, New York, the Beacon Natural Market. If you happen to be near this town, stop. The Main Street is a nice browsing street, with interesting stores, and the used bookstore adjacent to the library has fantastic deals. I’m even more of a sucker for bookstores than for food stores. Books never bite back. Ingredients: Brown rice flour, white rice flour, buckwheat flour, millet flour, palm oil, brown pure cane sugar, evaporated cane juice crystals, honey, vanilla, natural flavors, salt, sodium acide pyrophosphate, baking soda, xanthan gum, konjac flour, rosemary extract. Packaging promises: Dairy-free, nut-free, soy-free, gluten-free, free of wheat, dairy, peanuts, tree nuts, egg, soy, fish, shellfish and made without casein, potato, sesame, and sulfites, Certified Gluten-free, kosher pareve (neither meat nor milk products) by the Chicago Rabbinical Council, Non-GMO Project verified, made in a dedicated nu-t and gluten-free bakery. I have experience with Enjoy Life products. I use the chocolate chips pretty regularly, and I buy their chocolate bars occasionally. I’ve tried other cookies in their lines, and they are fine. For boxed cookies free of my allergens, yeah, they’re good. I’ve just never been a big fan of chocolate chip cookies from a box. But this was vacation and I love graham crackers, so I bought this box. First off, these are way better than any boxed chocolate chip cookie. 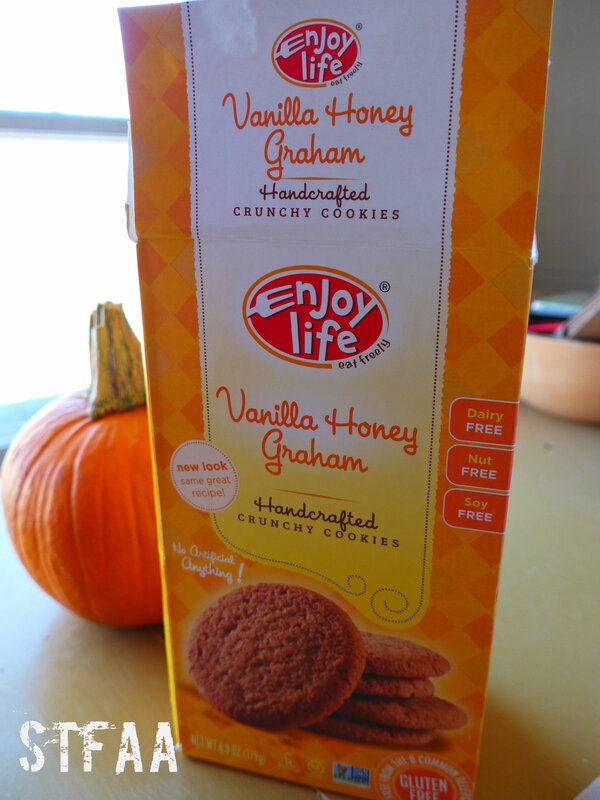 But they don’t really taste anything like graham crackers to me. These are sweeter and brighter and remind me most of Nilla Wafers. I really wanted some chocolate pudding to go with them (a favorite combo from college). They were really good with coffee and/or hot chocolate, too. They are a little crisp, but not hard, and they did not immediately go stale or soft after being opened. That said, they were gone in 4 days (road trips need snacks), so I don’t know how long they’d be okay. STFAA Review Conclusion: I think these were a good buy. I don’t get to have too much in the way of dessert when away from home, and I admit to missing it. I would buy these cookies again. Since they’re allergy-friendly, they come with a price tag that would discourage Cookie Monster-like antics, so they will remain an indulgence. Maybe for all road trips? The crunchy line of cookies is, to me, a lot better than Enjoy Life’s soft cookie line, but sadly, we only seem to have the soft ones locally.